Important: Emby Server can be installed from either Asustor App Central, or by manually installing the packages provided here. The version in Asustor App Central may sometimes be a little behind the latest due to the Asustor review process. To copy the file to your Asustor, Open App Central -> Go to Manual Install -> Click Browse -> Select the package -> Click Upload. Important: Emby Server can be installed from either the NetGear ReadyNAS app store, or by manually installing the packages provided here. The version in the ReadyNAS app store may sometimes be a little behind the latest due to the NetGear review process. Ensure you're running ReadyNAS 6.8.0 or greater. If version 6.8.0 is not detected by "check for updates", it can be downloaded and installed via the admin interface. – Upload the deb for your architecture via the apps tab in the admin interface. A popup should appear to keep you updated on the installation progress. – When the installation is over, you should see Emby appear in the apps tabs on the admin interface, you can turn it on if it's not already and the launch button will take you to the install wizard. You may need to configure storage within your FreeNAS Jail in order to allow Emby to access it. See Adding storage to FreeNAS. For Open Media Value, we recommend using either the Emby Docker installation, or the Emby Debian package. Install QMono from QNAP Club. Install Emby Server for QNAP by downloading from the QNAP Community..
Start Emby from the QNAP web interface, then visit http://localhost:8096 to run the Emby setup wizard. To get faster access to updates, you can always download the latest version from the QNAP Community. 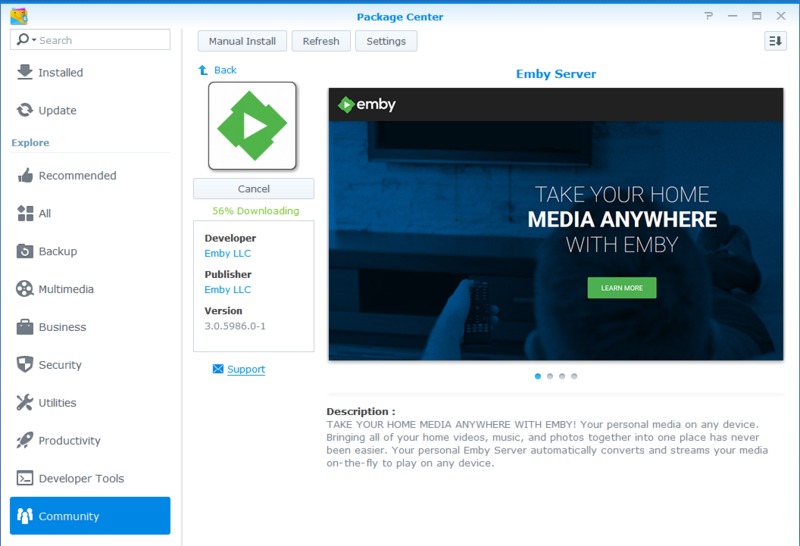 An Emby supported package is now available for all Synology* (and XPEnology) platforms! The package is supported on systems running DSM 5.2-5967 or later. * Support for QorIQ based machines (DS213+, DS413) is not currently possible. 1) The first thing you need to do is add the Emby repository to Package Center's settings. * XPEnology users, please use https://synology.emby.media/?package_repository=360efc6e-de72-4073-b603-2bfbd7001586 and make sure you take a look at the XPEnology Users Read Me. 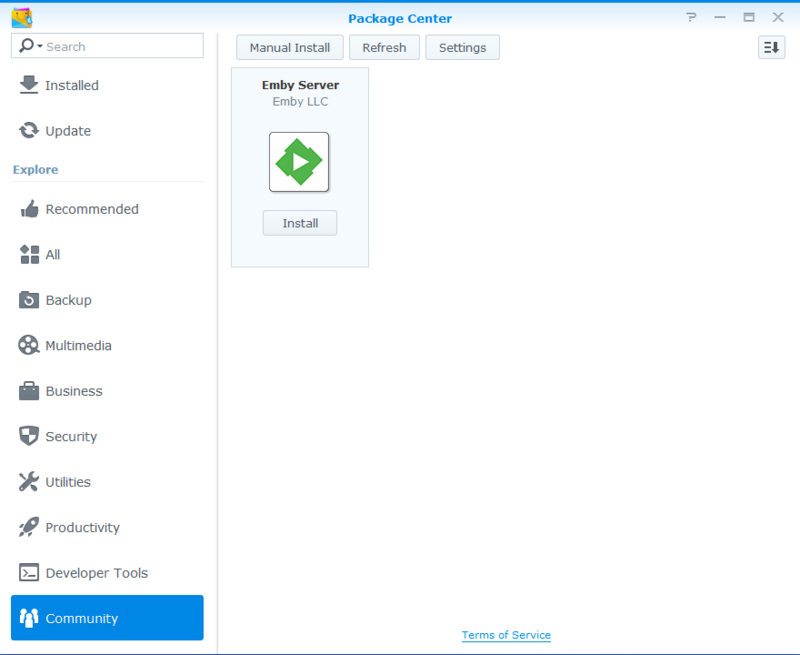 2) Now configure Package Center to trust the Emby package repository. 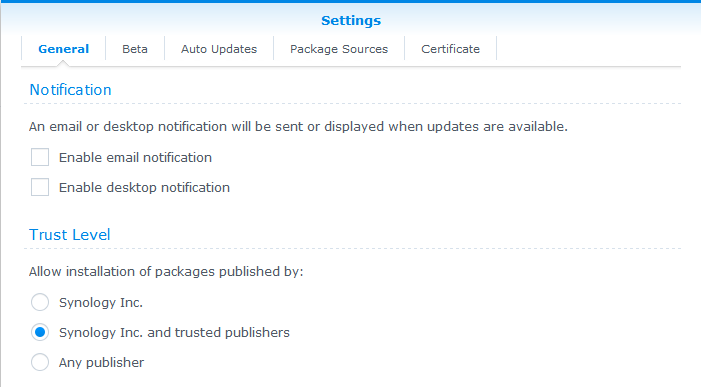 3) We can now explore Package Center and locate the package to install it. 4) Once you've clicked install, it will take a few minutes for the package to become available. 5) When the install completes, Emby will be running and you can get started by clicking on the URL! Read our guide on how to set up your media library share. RECOMMENDED! Have a look through the Synology specific content on the Wiki. Emby for TerraMaster NAS is available using the TerraMaster app store. Important: Emby Server can be installed from either the Thecus app store, or by manually installing the packages provided here. The version in the Thecus app store may sometimes be a little behind the latest due to the Thecus review process. See below for instructions on how to install from the Thecus app store. 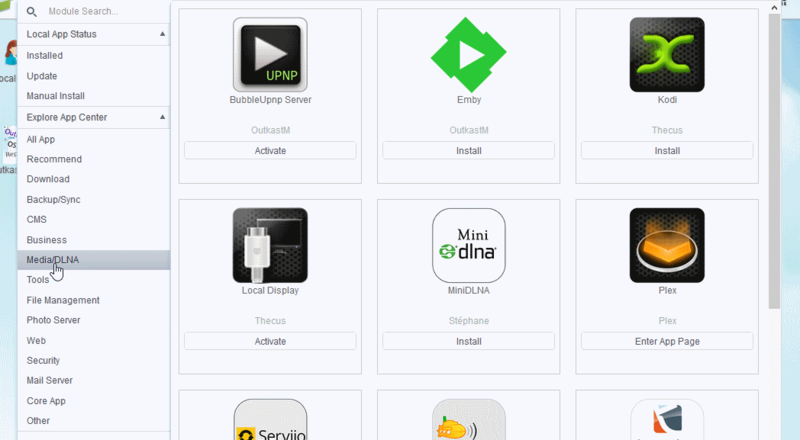 Install Emby using Thecus AppCenter. First open AppCenter. Locate Emby either by searching or under Media/DLNA. Click Install. When the installation has completed, click Enter App Page. From here you can access the Emby web interface to begin the Emby Setup Wizard. If these are not installed, the installation of Emby will fail with a message that dependencies are not meat. Install Emby Server using the Western Digital Web interface. Start Emby Server using the Western Digital Web interface.